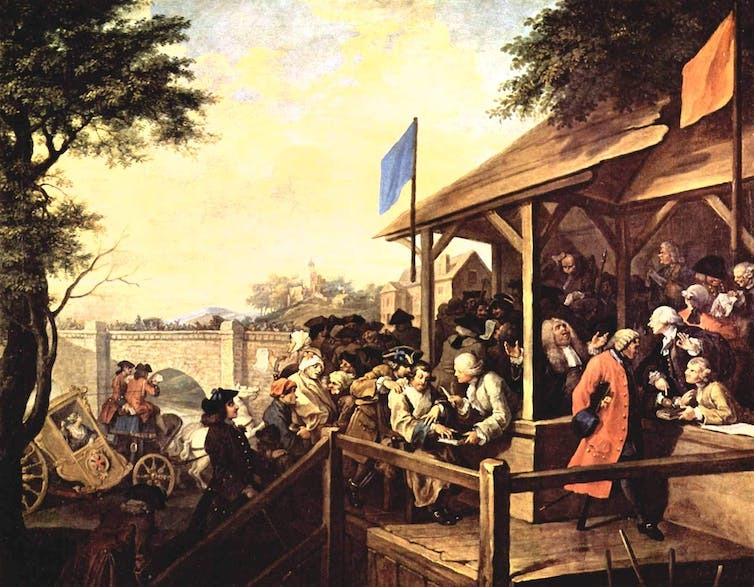 Hogarth’s The Polling, from the Humours of an Election series. Most of the voters who will be casting their ballots in the general election on Thursday June 8 will take their right to do so for granted, unaware of the contested history of this now familiar action. It’s actually less than 100 years since all adult males in the UK were awarded the franchise for parliamentary elections, in 1918, in the wake of World War I. That right wasn’t extended to all adult women for a further ten years after that. Even today, it might be argued, the democratic principle of “one person, one vote” has not been fully implemented, since the royal family and members of the House of Lords are not allowed to vote in parliamentary elections. And even after the mass enfranchisement of the early 20th century, university graduates and owners of businesses retained a double vote, the former in their university constituencies as well as where they lived. These privileges were only abolished in 1948, in face of overwhelming Conservative opposition. How Britain votes today is also a relatively late development in electoral history. Until 1872, parliamentary electors cast their votes orally, sometimes in front of a crowd, and these choices were then published in a poll book. Public voting was often a festive, even riotous affair. Problems of intimidation were widespread, and sanctions might be applied by landlords and employers if voters failed to follow their wishes, though this was widely accepted at the time as the “natural” state of affairs. Open voting even had its defenders, notably the political radical John Stuart Mill, who regarded it as a manly mark of independence. But as the franchise was partially extended in the 19th century, the campaign for secrecy grew. The method that was eventually adopted was borrowed from Australia, where the use of polling booths and uniform ballot papers marked with an “X” was pioneered in the 1850s. More recent reforms took place in 1969, when the voting age was lowered from 21 to 18. Party emblems were also allowed on the ballot paper for the first time that year. It’s this kind of paper that will be used on June 8. What no one predicted, however, when these franchise and balloting reforms were first implemented, is that voters would simply not bother to turn out and that they would abstain in such considerable numbers. To be sure, this is a relatively recent phenomenon. 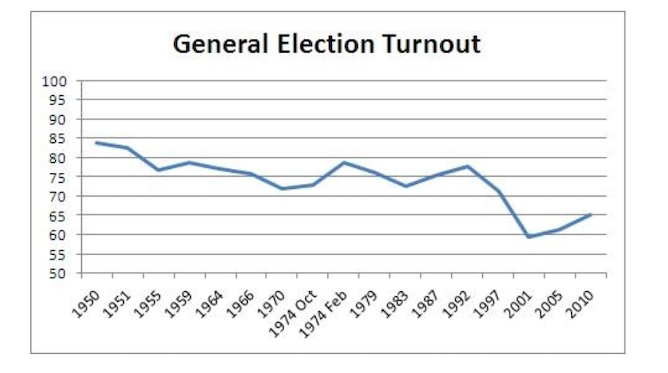 In fact, turnout for much of the 20th century at general elections remained high, even by European standards. The best turnout was secured in the 1950 general election, when some 84% of those eligible to do so voted. And the figure didn’t dip below 70% until 2001, when only 59% voted. Since then things have improved slightly. In 2010, turnout was 65%. In 2015, it was 66%. But the fact remains that, today, a massive one-third of those eligible to vote fail to do so, preferring instead to stay at home (and the situation in local elections is far worse). What was a regular habit for a substantial majority of the electorate has now become a more intermittent practice. Among the young and marginalised, non-voting has become widely entrenched. Greater personal mobility and the decline of social solidarity has made the decision to vote a more individual choice, which may or may not be exercised according to specific circumstances, whereas in the past it was more of a duty to be fulfilled. Voters rarely spoil their papers in the UK, whereas in France it is a traditional form of protest that has reached epidemic proportions: some 4m ballot papers were deliberately invalidated in the second round of the recent presidential election. Like the rise in abstention in both countries, it surely reflects disenchantment with the electoral process as well as disappointment with the political elite. In these circumstances, the idea of compulsory voting has re-emerged, though in liberal Britain the idea of forcing people to the polling station has never exerted the same attraction as on the continent. The obligation to vote is a blunt instrument for tackling a complex political and social problem. When the interest of the electorate is fully engaged, as in the recent Scottish or EU referendums, then turnout can still reach the 75% to 80% mark. However, in the forthcoming parliamentary election, following hard on the heels of its predecessor in 2015, the EU vote and elections to regional assemblies in 2016, plus the local elections in May, voter fatigue may take a toll. It’s hard to envisage more than two-thirds of those entitled to do so casting their ballot on June 8. Given the relatively small cost involved in conducting this civic act, which is the product of so much historical endeavour, such disaffection must be a cause for significant concern. 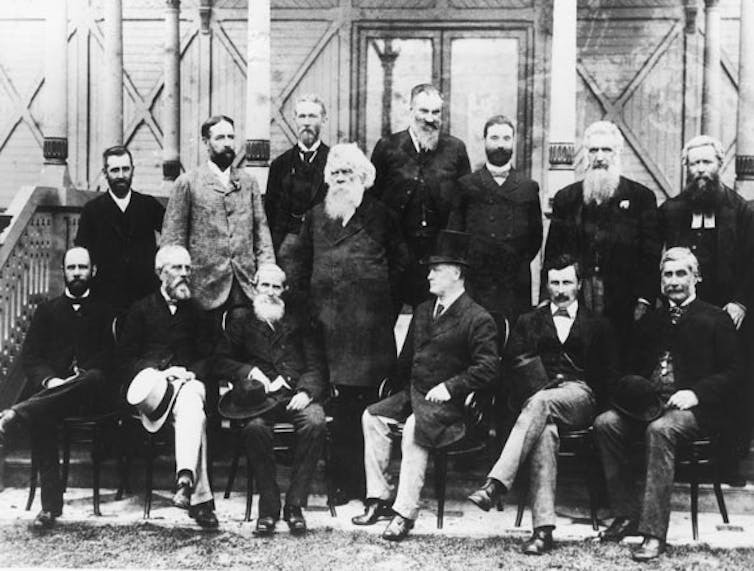 Delegates to the Australasian Federation Conference, Melbourne, 1890, where being white, male and bearded was standard form. Maybe seven really is a magic number. 2017 certainly has a lot of tricks up its sleeve. And as we’ve heard in recent weeks, 2017 is the 50th anniversary of the 1967 referendum, the 25th anniversary of the Mabo ruling, the 20th anniversary of the Bringing Them Home Report and the 10th anniversary of the Northern Territory intervention. These are all significant milestones in Australian history and the legal, political and cultural relationship between Australia’s colonisers and its colonised. In May, we witnessed the historic coming together of 250 indigenous delegates at Uluru to determine what form of constitutional recognition to seek from the Australian parliament. But this is not the first time that locally elected delegates have gathered in one location to thrash out the legal and moral framework for establishing the principles through which our nation should be constituted and our people counted. This year is also the 120th anniversary of the Australasian Federal Convention. In April 1897, ten elected delegates from each of Australia’s colonies (except Queensland, which did not attend) gathered at Parliament House in Adelaide to map the route to nationhood, a Commonwealth of Australia. Six years earlier, delegates appointed by the colonial parliaments met in Sydney to discuss a draft constitution for federating the British colonies in Australia and New Zealand. But 1897 was the first time that members of the Constitutional Convention were appointed by popular vote. (New Zealand was no longer included, having decided that being part of a trans-Tasman Commonwealth was not in its best interests.) Here was a novel experiment in democracy: allow the people to elect representatives to draft a constitution that would be submitted to the people for their assent. Much has been made of the lack of unity at the Uluru Convention. But surprise, surprise: the 1897 Convention was no chorus of harmonious hallelujahs either. the constitutional conventions were horse-trading bazaars at which premiers and their cohorts worked to protect the interests of their colonies. Commerce and finance also manoeuvred to secure their short and long term investments. Hirst argues that if Federation was a business deal, as is commonly averred, it was a shaky one, with issues such as tariffs more often “divisive and tricky” than designed to broker consensus. One major point of discrepancy among delegates at the People’s Conventions is what became known as “the Braddon Clause” (named after then Premier of Tasmania, Edward Braddon) whereby three-quarters of customs and excise revenue acquired by the Commonwealth would be returned to the states. Critics of “the Braddon Claws” feared this would lead to smaller states pilfering the profits of the more populous states. While Braddon’s initiative became Section 87 of the Commonwealth Constitution, many other issues were determined provisionally, with the get-out-of-jail-free rider “until the parliament otherwise decides”. Perhaps the most significant of the Federal Convention’s sticking points was the issue that would eventually make Australia a global exemplar in democratic practice: women’s suffrage. “Votes for Women” was the international catch-cry of the day, but in Australia, on the precipice of nationhood, the matter turned on what could be termed the “constitutional recognition” of women. At the 1897 Convention in Adelaide, “warm Federalist” Frederick Holder and Charles Kingston, South Australia’s premier, proposed that full voting rights for all white adults should be written into the Constitution. Three years earlier, South Australian women had become the first in the world to win equal political rights with men: the right to vote and to stand for parliament. (New Zealand women won the right to vote in 1893, but eligibility to stand was withheld until 1919.) Playing with a home ground advantage, Holder moved to add a clause to the draft Constitution that read “no elector now possessing the right to vote shall be deprived of that right”. If South Australian women could not lose their citizenship status — their right to be counted — then the rest of Australia’s women must achieve it. Holder and Kingston threatened that, should the new clause not be approved, South Australia would vote against joining the Commonwealth. Despite Barton’s protests, a poll was taken and the ayes won by three votes. Universal suffrage effectively became the precondition of a federated Australia. However, the Commonwealth Franchise Act of 1902, which made Australian women “the freest of the free”, was the same legislation that stripped Aboriginal Australians of their citizenship rights – legal personhood – which they would not claw back until 1967. 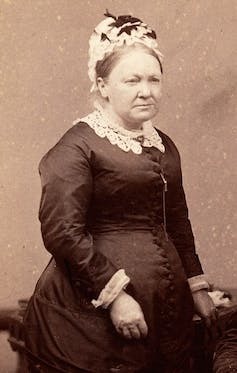 Catherine Helen Spence, Australia’s first female political candidate. If the founding fathers had one thing in common, it was that they were indeed all men. Monochrome photos of the Constitutional Conventions depict the monocultural make-up of the delegates, whether elected or appointed: white, bearded, suited. But there were plenty of founding mothers in the wings. South Australian Catherine Helen Spence became Australia’s first female political candidate when she unsuccessfully stood as a candidate for the 1897 Convention. (Another 2017 anniversary, albeit one of apparent failure.) Spence’s proposal for political reform – what she termed “pure democracy” — did make it into the Constitution: the principle of one-man one-vote was not her idea exclusively, but she fought for it with ferocious tenacity. According to her biographer, Susan Magarey, Spence also made proportional representation “the talk of the colony”, later developing a system for the fairest distribution of preferences (a system so unwieldy it has never been implemented). Though Spence was a leader of the women’s suffrage movement in South Australia, her life’s major mission was to rectify the injustices of the electoral system to ensure “the elevation, educational and spiritual, as well as economic, of all humanity”. Alfred Deakin concluded that Federation was achieved through a series of miracles. The road to nationhood was not always smooth, seamless or virtuous. Vested interests, entrenched prejudices, competing perspectives and outsized personalities meant that achieving “consensus” was a juggling act that required immense skill and determination. Balls fell. Some were picked up and thrown back in the ring. The nation that emerged was, and is, complex and conflicted. Catherine Helen Spence’s system for electoral reform may not have been initiated, but let’s hope that the ongoing process of constitutional reform ultimately achieves her broader goal: the elevation of all humanity.